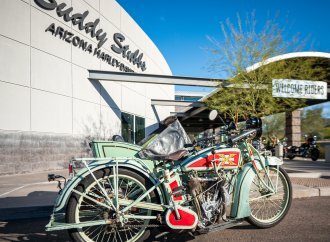 Like art, I find the beauty of vintage motorcycles to be in the eye of this beholder. Even though I am not a rider — I’ve shared in this space before how I had a cousin who was critically injured in a motorcycle accident and my mother, a former U.S. Navy nurse who had patched up so many wounded warriors during World War II, immediately turned to me and announced with hellfire and brimstone in her voice that I would never get onto such a contraption. Of course, years later my younger brother not only bought a motorcycle but took my Mom for a ride, which she reportedly enjoyed. And that’s OK, because I much prefer to have four wheels beneath me, and who knows, she may have saved my life, because I have a scar on one of elbows and another on one of my ankles from tumbles I took on regular, human-pedaled bicycles. Nonetheless, I have a sincere appreciation for vintage motorcycles, which I see and enjoy as amazing works of mechanical artwork, wonderful sculptures that can, quite literally, take you to another place. 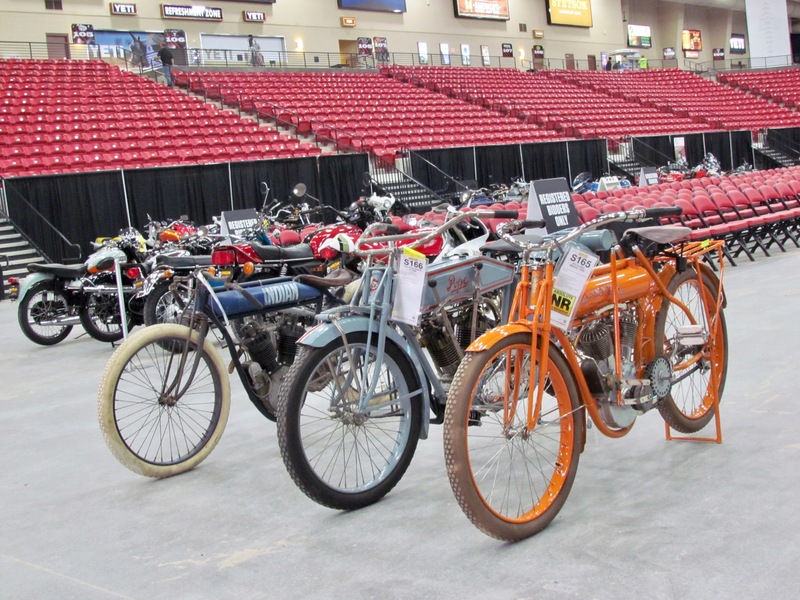 Monday afternoon, I had the great pleasure of wandering around the sports arena and equestrian pavilion at the South Point hotel and casino at the south end of Las Vegas Boulevard where, starting on Tuesday and running through Saturday, around 1,750 motorcycles will cross the auction block at Mecum’s 28th annual Las Vegas motorcycle auction. 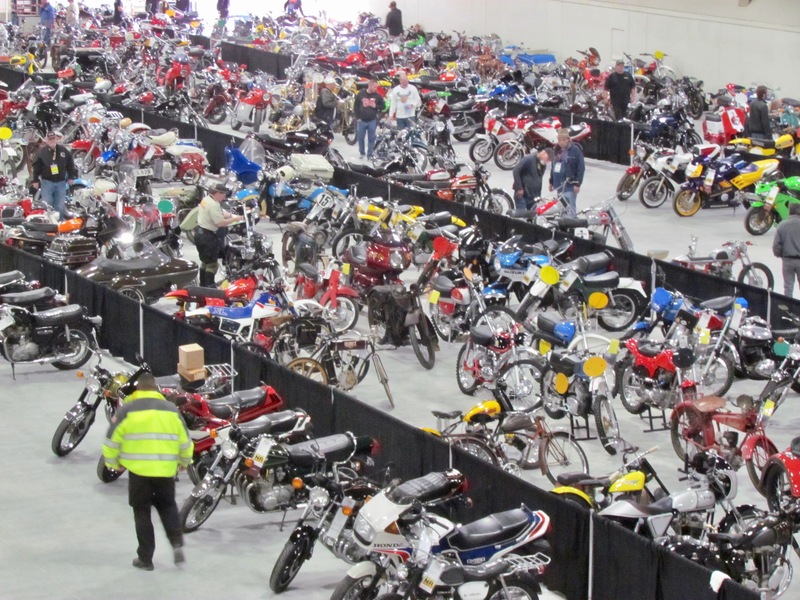 Motorcycles were still being delivered and checked in while I was there, but I got to see — once again — the amazing MC Collection from Sweden and more than 1,000 other bikes, more than enough to keep me happy, and my camera busy, for a couple of hours. 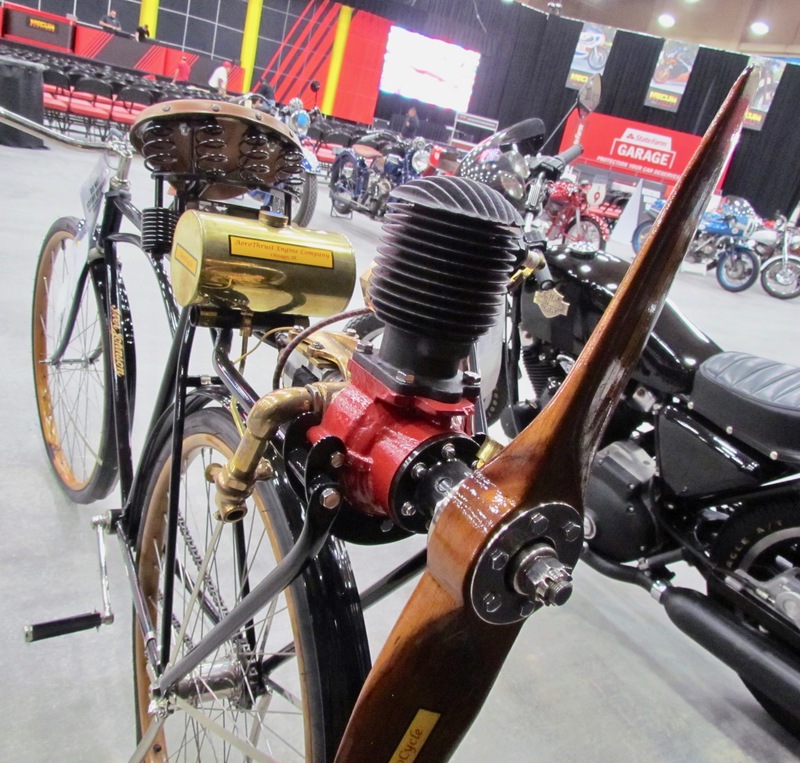 At first glance, you might think this 1919 Johnson Motor Wheel was just a bicycle — until you notice that there’s an opposed 2-cylinder 2-stroke engine mounted just behind and below the Wright’s Olympic saddle. That artistic if diminutive engine is fed by a brass fuel tank and turns the rear wheel. 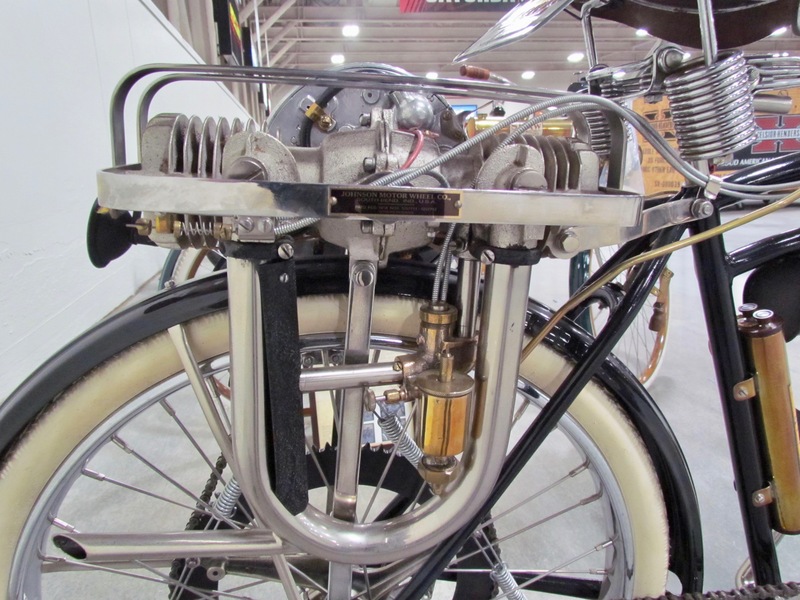 Parked next to the Johnson is a 1909 Shaw, another motorized bicycle, with wooden wheels and a belt-drive system empowered by a gorgeous and also diminutive engine mounted more typically within the Bi-Motor Equipment Black Diamond frame. Yes, that’s a propeller mounted at the rear of this machine. 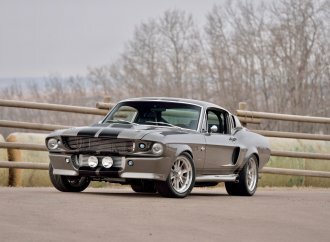 “Rare, rare, rare,” says Mecum of this propulsion system. 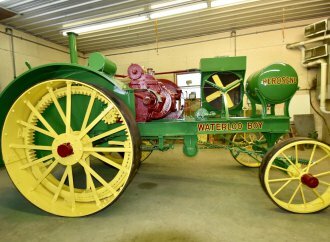 The Aerothrust Engine Company of LaPorte, Indiana, produced small and portable prop-motors from 1913-1919, primarily for use on boats. 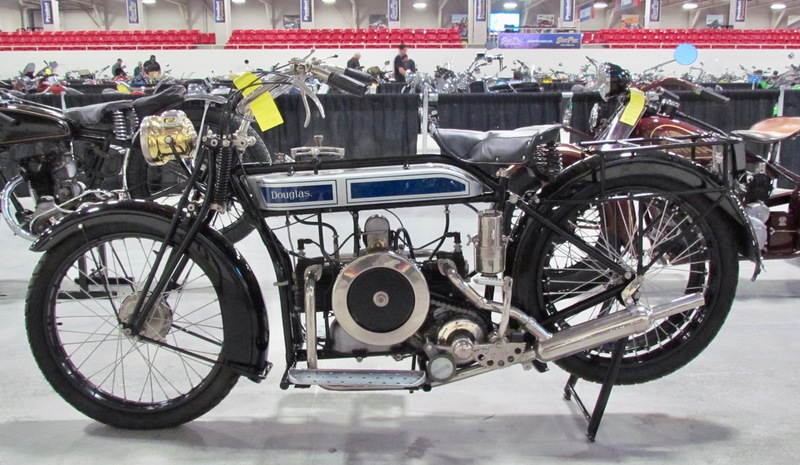 It also produced a single-cylinder version for bicycles and claimed it could propel a bike up to 60 mph. 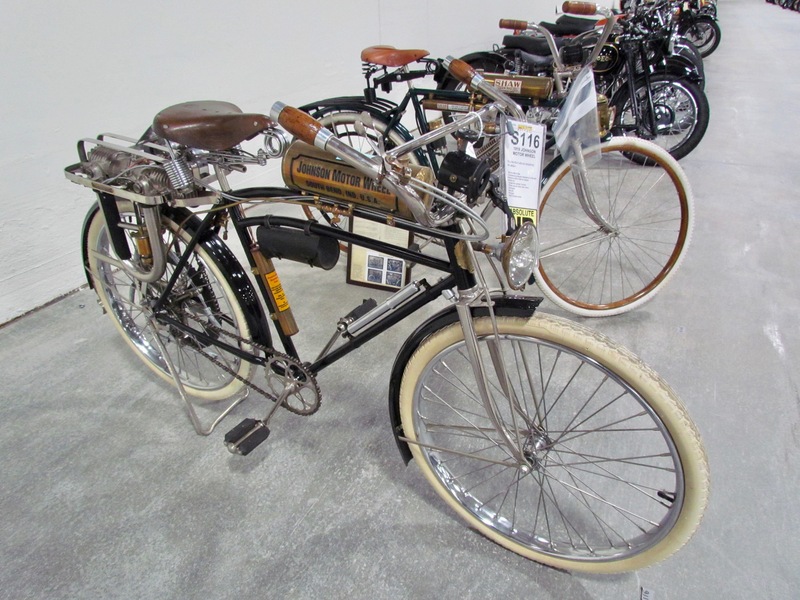 The bike on which it is mounted at the Mecum auction is a 1915 Iver Johnson produced by the Iver Johnson Arms and Cycle Works, which began making guns in 1891 and started building motorcycles in 1907. I’m a sucker for vintage motorcycles with side cars. 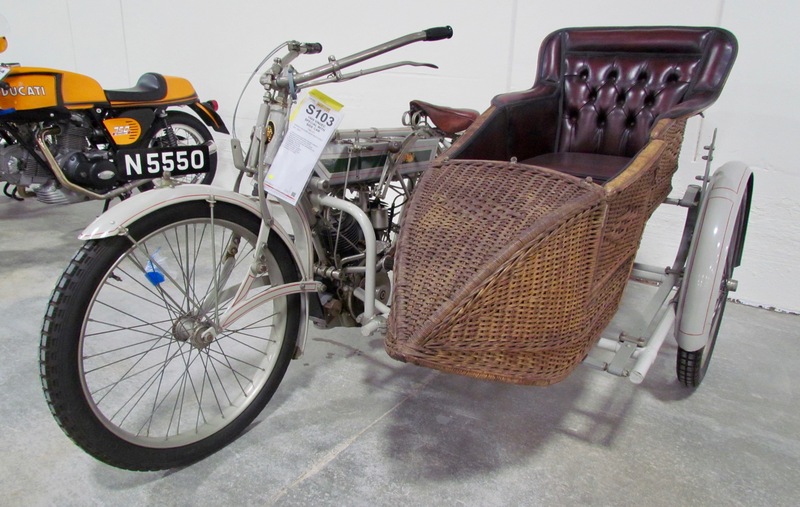 Not only had I never heard of the Vindec brand — turns out it was produced by Koln-Linderthaler Metallwerke in Cologne, Germany, and sold in England — but I’d never before seen a wicker side car. 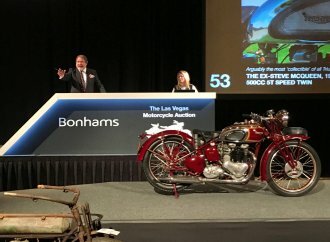 Turns out, this bike and side car had been part of the famed and acclaimed Otis Chandler car and motorcycle collection. 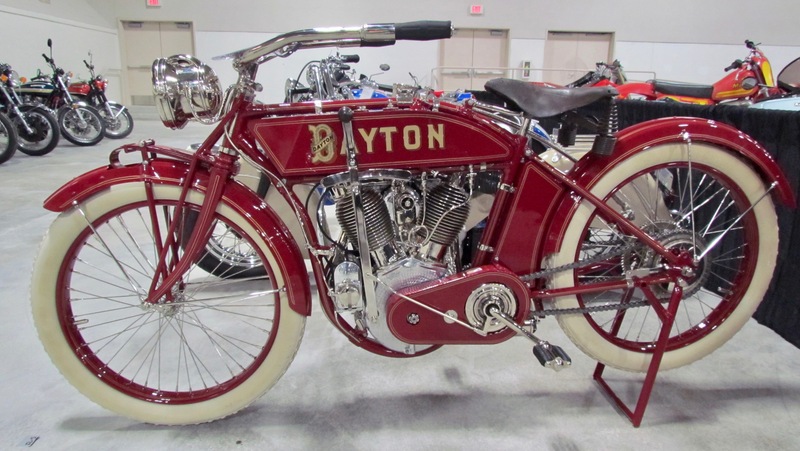 Dayton bikes were manufactured by the Davis Sewing Machine Company of Dayton, Ohio and apparently there are very few of them still around. 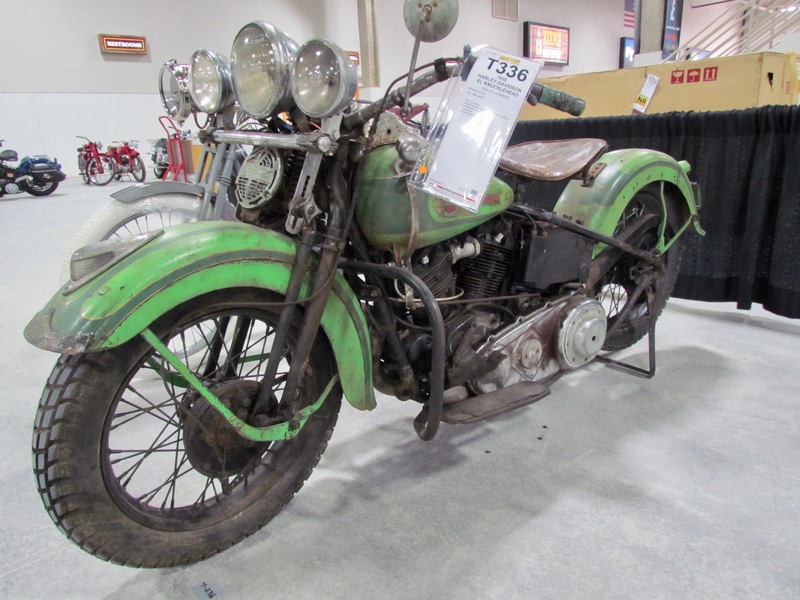 This one, which also features a Hine-Watt Columbia headlight and Stewart Speedometer, is expected to sell for six fixtures at the auction. Von Dutch created this two-wheel sculpture – a hobby-horse pedestrian curricle — while working in Bud Ekins shop, and he left it there when he quit. Elkins kept it and took it home when he closed his business. 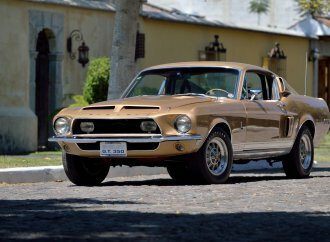 He sold it in 1985 to Willie Chambers who later sold it to Jim Lattin, from whose collection to comes to auction. OK, so it’s not a motorcycle, but it’s an amazing piece of Americana sculpture with incredible provenance. I have a 4-year-old grandson who, upon entering my house, immediately heads to the refrigerator and asks if I have any ice cream, meaning the ice cream sandwiches he and I both enjoy. 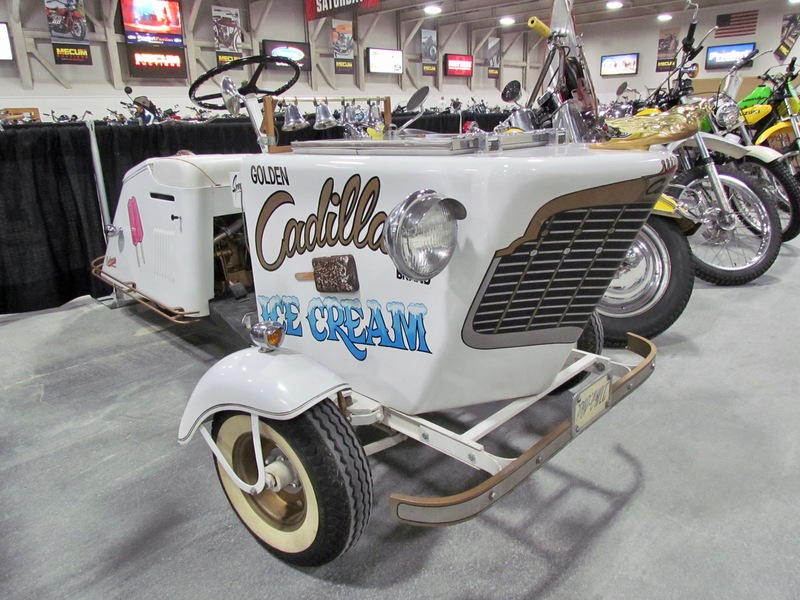 Imagine how he’d react if I rolled up to his house in this recent re-creation of the classic ice cream scooter. 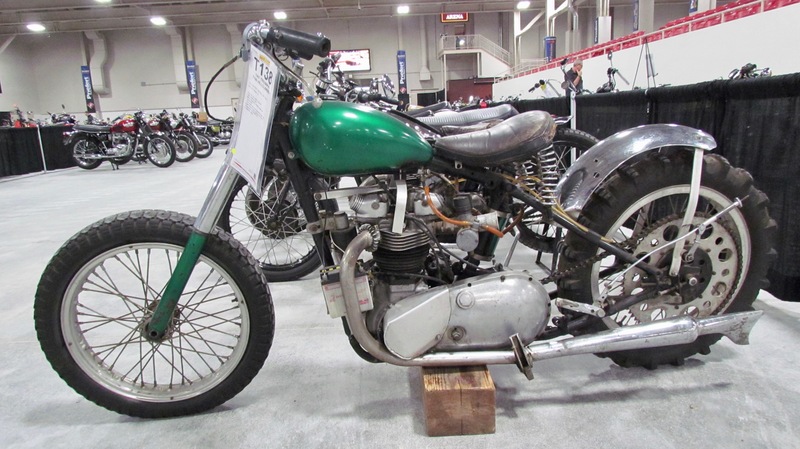 This big brute of a motorcycle is not me, but with its unrestored patina, it is wondrous to behold. Another definitely not me machine, but back when I was a young sportswriter for a daily newspaper, I was assigned to cover motorcycle hillclimb races and was immediately convinced the riders were insane as they tried to power their way up the seemingly vertical face of a mini-mountain. 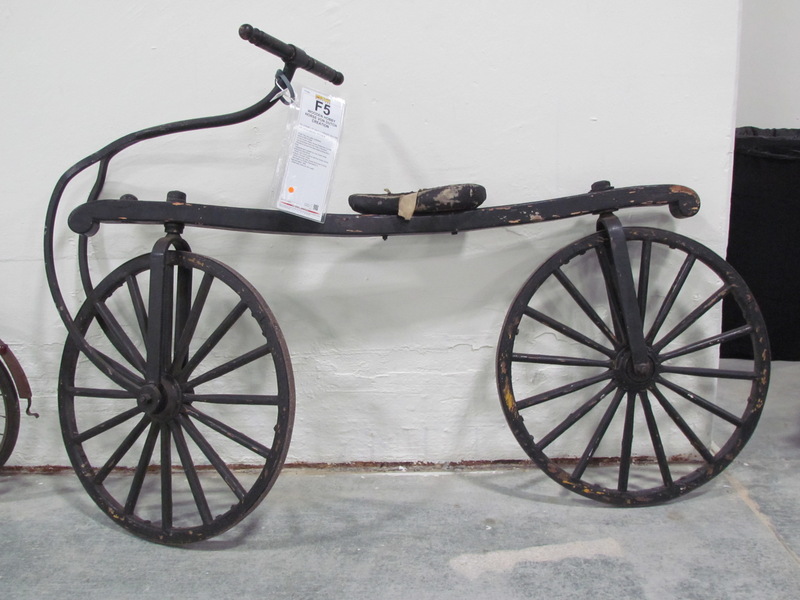 This bike also is from the Jim Lattin Collection. 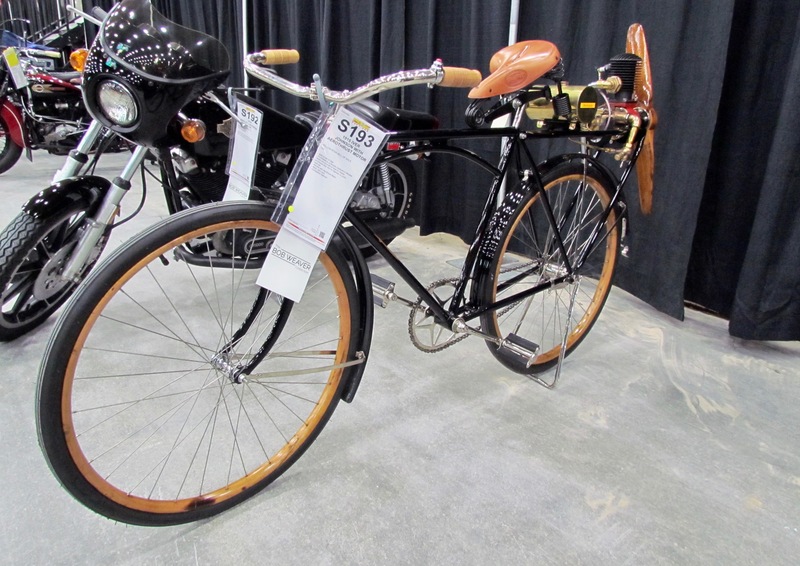 Here’s another bike I’d never seen before, though I’d seen other Velocettes. This is an example of a model produced from 1948 to 1970 for British police, who termed it “the noddy bike” because while riding they were allowed to simply nod rather than salute those of higher rank. The LE stands for Little Engine, a 200cc unit. Because of frequent starts and stops, that lever on the right side allows the bike to be started with a pull rather than by kick starter. It also has a 3-on-the-tree gear shifter. 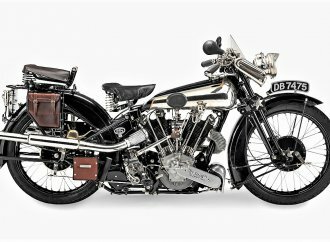 Douglas was a British brand that produced tens of thousands of motorcycles for military use during World War I. 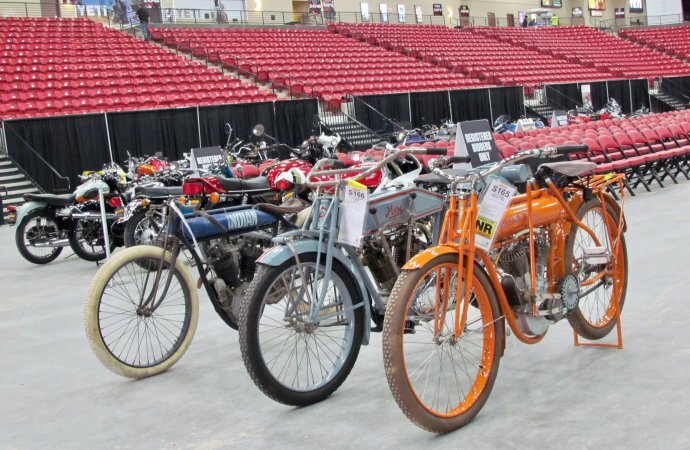 After the war, Douglas bikes were popular with dirt-track racers. 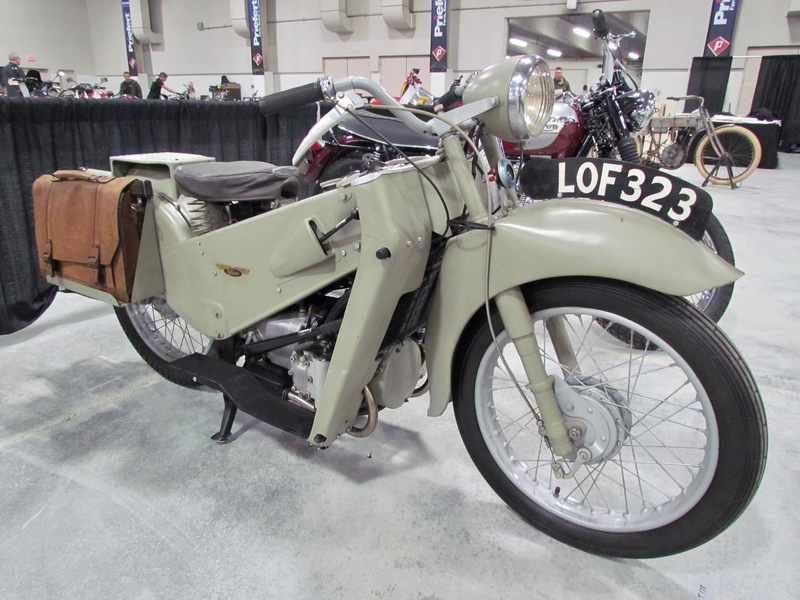 This ’28 model reportedly is a rare Colongical version and among the last with a flat fuel tank.